Last night’s Leafs game was a fun one. The team was good, and William Nylander was even better in what was most definitely the best game of his young career so far. But there was a moment that almost distracted from the entire thing; a hit by Nazem Kadri that turned into some theatrics involving two Calgary Flames forwards. The full sequence can be found here, but let’s break it down into chunks. Interestingly, the part of the play that started it all is perhaps the least important. Kadri hits Gaudreau along the boards shortly after the Flames forward strips Martin Marincin of the puck. The hit isn’t high, Kadri’s right foot doesn’t even leave the ice on the follow through, and impact is made with the shoulder, its a great hit. Coincidentally, Mark Masters asked Gaudreau about avoiding being hit, and how he reacts when someone does get him. “Keep your head up,” Gaudreau said of his aversion tactics. Guys like Zdeno Chara in this league, you know, when you get hit by him you’re going to be out for a few weeks. Just keep your head up and making sure you’re quick and speedy down low to avoid those hits.” Gaudreau doesn’t keep skating and his head is tracking his clearance; obviously, it his plan didn’t work here. He did mention remembering hits the next game, so maybe we’ll see some retribution down the line. By maybe, I meant “yes”, and by “down the line”, I actually meant three seconds later. 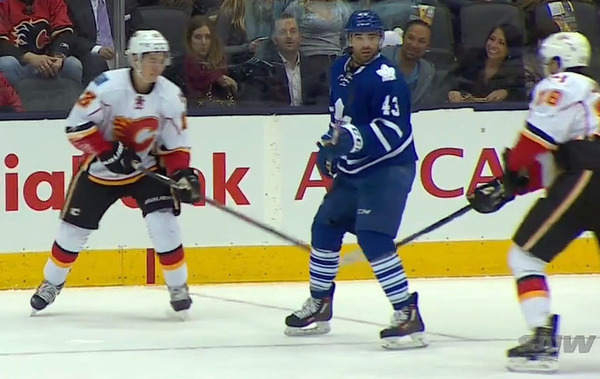 Gaudreau and 25-year-old sophomore Josh Jooris did not take kindly to Kadri’s hit. Jooris immediately skates up to respond, and Gaudreau sees Kadri looking in Jooris’ direction. Within milliseconds of each other, both Flames slash Kadri in the back of the legs; Jooris chopping first on the left, Gaudreau hitting seconds on the right side. Interestingly, Gaudreau and Kadri were the ones who received penalties from this part of the sequence. Johnny Hockey received a minor for slashing while Kadri received one for embellishment. The latter call seemed particularly suspect. I don’t know about you guys, but I don’t like the feeling I get when slashed in the back of the leg, where the only protection I have s a thick sock. Kadri stood up to the first slash pretty well, but when Gaudreau brought the pain to the second leg, he gives in. If I had to guess, the embellishment was for the stick flying in the air. Which, I mean, it did go a little high. But those things are light these days. I won a Dion Phaneuf pro stock once, and I when I tossed it in the air, it had a moment where it floated. I imagine someone could get some serious hang time with an “I’M IN PAIN” toss. Two slashes was already an excessive response to a clean, legal hit along the boards, but Jooris wasn’t satisfied. Before Gaudreau’s slash had full sent Kadri to the ice, Jooris began putting Kadri in a head lock. After a body slam with little room to recover from, Kadri curled up and began to hope his teammates would break things up, which, give them credit, they did. To this day, I don’t understand how any sort of reaction like this, no matter what the team, is only a two minute roughing. Really, they’re calling roughing based on the fact he threw a punch. But it was clearly a one-way instigation, Jooris clearly threw his gloves on, and it’s clearly an attack rather than a battle. You’d think a double minor would be in order here; even if it’s calling his initial slash. Gaudreau wasn’t a fan of Kadri curling up, making a “turtling” gesture as he headed to the box. I like Johnny Hockey a lot, but this doesn’t make much sense. Gaudreau is the one who had a freak out after a clean hit. Gaudreau is the one who slashed a player in the legs while he wasn’t looking because, well, someone else was about to slash him in the legs. Gaudreau is the one who has never fought in his professional hockey career, and he’s the one mocking a guy who was just double slashed and put into a headlock for not liking his odds if he tried to get back up with someone on top of him? There’s nothing wrong with this in the rulebook, but it’s still a pretty unnecessary move. In the end, the Leafs ended up with only a single man advantage from the whole ordeal, as Kadri, Joonas, and Gaudreau all had minor penalties. To make a less-than-preferred situation into a bad one, Matt Stajan ended up scoring a shorthanded goal before everybody returned to the ice. But, of course, Kadri and the Leafs shook it off, and a certain other offensively-driven forward did his magic to secure his team a win in the late second and early third periods. Kadri insisted after that game that there was nothing he could do and that he was jumped. Gaudreau didn’t speak to the media after the game, nor, according to Kadri, did he do much talking after the sequence. I have to agree that the refs got this wrong on Kadri. He did nothing wrong here. The other issue is how refs are biased because the media says Kadri dives and is gaining a reputation of drawing too many penalties. And then you have guys these ancients guys like Burke who would say blow smoke on the radio about how Kadri is one of those “rats” taking over the game, when the problem is those in authority nor their players won’t respect the game of hockey and a clean hit. I blame Burke and his type for all this garbage we see and not Gaudrea or Kadri. I have seen quite a few wrong penalty calls this year. Not only against the Leafs. I wonder what the refs think, if they bother to watch the penalty replays after a game? Has the standard of refereeing dropped? Didn’t Kadri do that throat slashing gesture the last time he played the flames. Kadri has been in the middle of this and sometimes innocent, sometimes guilty but always fiesty. You guys are reading this all wrong. When Gio clobbered Kadri the last game for puck watching and Kadri held his face trying to sell he got hit in the face, tell me how many leafs “defended” their team mate? Not one. Kadri simply went to bench and slashed his throat. Kadri’s hit on Gaudrea was “retribution”. And notice how many teammates of Gaudrea stepped in when he was bodychecked. Clearly Kadri’s teammates don’t care enough for him to stick up for him. That is the real issue on the leafs. And it is not about enforcers but sticking up for one another. The hit wasn’t exactly “clean” Kadri’s left leg slew foots Gaudreau to take him off balance first. The slashes were bad but that stick throwing drama was embellishment! Your arms don’t go up when you’re hit in the legs they go down to the point of contact. I’ve never stubbed my toe and grabbed my head! And that turtling crap was embarrassing. Stand up and fight him! Win or loose people will respect you. Or stand there and take the punches if you want to draw a penalty. What Kadri did brought him nothing but dishonour. Don’t really see a slew-foot. Kadri hits him and the leg goes up as “Johnny Hockey” goes into the boards. Have to admit though, that stick in the air was a bit much. Even though Kadri isn’t a fighter, when given the chance he’ll fight. Remember the Backes fight – he didn’t back down or away from that one. It’s the leg going up that causes “Johnny” to fall though as opposed to just taking a hit. That’s what P.O’d Calgary. That and the fact that Kadri threated to slice Johnny hockey’s throat in their last meeting. The refs made the right calls. I agree that Kadri can fight and will stand up for himself. That’s what he should have done. Kadri is an enigma, he does a lot of things right and a lot of things wrong. There’s times he shows brilliance with the puck and other times when he’s selfish and shoots low percentage shots or gives the puck away too often. I want to love him but he’s disappointed me too many times. Nope. Watch it again. The leg that leaves the ice doesn’t go anywhere near Johnny’s leg’s or feet. If anything, the leg pinches him against the boards. That is no slew foot. Gaudreau falls from the force of the check, which is fine, it was a big check and he’s on ice. People fall. The hit was 100% clean. And it’s hard to fight someone when they jump on your back and start hitting you before you can defend yourself. When you threaten someone’s life with a throat slashing gesture, like Kadri did, you deserve what you get. Kadri should be grateful, He got off easy if you ask me. To begin with there should be an immediate penalty to this getting a guy for a clean hit. If the ref’s make a game personal because they believe a player dives then the game becomes a mockery and the refs take center stage. The penalty on Kadri was suspect!? Oh come on, man! Stop being such a homer! It was obviously embellishment. Normally a player would just react in pain to a slash by going down to one knee. But he jerked backward and actually throws his stick into the air! Hahaha. Nice try, Nazem! On a side note, I would try and move Kadri out in the offseason. I don’t think his teammates like him and he’s failed to live up to his draft position. I know you’re being facetious. But what the Leafs could use is a guy like Tie Domi who was a useful hockey player but could take on anyone in the league if need be. Or better yet Gordie Howe! He’d score on you a couple times and then punch your face in! Unfortunately guys like that are hard to find. It’s probably better in the long run to build that team level of toughness and “sticking up for each other” than trying to find those guys, though. After all, the last time the Leafs tried to do that, they signed David Clarkson. Surprised Hrudey didn’t repel down out of the broadcast booth to right the injustice of the Gaudfather getting hit. All this attention to Kadri…. sure, he goes Shakespearian on us. But Gaudreau? That turtle imitation on the way to the box was stupid. When the play is dead it’s never a good idea to deride other players. You might bark, yell, scream about your mommy’s revenge. But derision? Totally uncool. Especially after you let your teammate play the retaliator. I would have had a lot more respect for Gaudreau if he had went directly after Kadri himself – just not with a slash. It’s not like Kadri is so much bigger than Gaudreau – we’re not talking John Scott vs. Phil Kessel here. Kadri throws the baton and gets caught of selling it and it’s an issue?